Almost every interaction in a child's world is preparing them to become a reader and writer. It's important to remember that there will be variations in the way children move through writing stages; it may not happen in the same way or at the same time and the lines between the stages can be blurry. Many models of writing development and word study label stages with their own terms using various descriptors. The descriptions below are designed to communicate common writing characteristics. 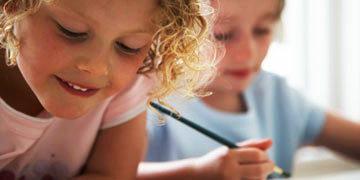 Most children begin their writing career by scribbling and drawing. Grasping the crayon or pencil with a full fist, a young scribbling child is exploring with space and form. He is creating a permanent record of his ideas and thoughts. These first scribbles can be proud accomplishments! Thick markers, crayons, and unlined paper are good writer's tools for this stage. At this stage of writing development, children begin to display their understanding that writers use symbols to convey their meaning. Writing begins to include shapes (circles, squares) and other figures. A writer in this stage will often write something and ask, "What does this say?" There's little orientation of forms and shapes to space (i.e., they appear in random places within the writing or drawing). Tubs of markers, crayons, and paper remain good writer's tools. As a child's writing continues to develop, she will begin to use random letters. Most children begin with consonants, especially those in the author's name. Pieces of writing are usually strings of upper-case consonants, without attention to spaces between words or directionality. At the beginning of this stage, there remains a lack of sound-to-symbol correspondence between the words they are trying to write and the letters they use. Later efforts may include letters for the salient sounds in words and include the author's own name. Different types of paper, including memo pads, envelopes, lined paper and some smaller pens and pencils are good writer's tools at this stage. Tubs of foam letters and letter magnets are also handy. As beginning writers practice their craft, they are learning many concepts about print. When a child points to individual words on a page when reading, and works to match their speech to a printed word, a concept of word is developing. This awareness of the purpose and existence of spaces separating words and that spoken words match to printed words is known as a concept of word. Often called the watershed event of kindergarten, adults watch young writers insert these important spaces in their own work. Guided either by an index finger in-between each word or by lines drawn by the teacher, children demonstrate one-to-one correspondence with words. At this stage, children write with beginning and ending sounds. They also may begin to spell some high frequency words correctly. Vowels may be inserted into words. As students transition to more conventional writers, they will begin to write words the way they sound. Punctuation begins as writers experiment with forming sentences. At this stage, children spell most words correctly, with a reliance on phonics knowledge to spell longer words. Writers use punctuation marks correctly and use capital and lower case letters in the correct places. Writing for different purposes becomes more important. First and second grade students often write signs for their bedroom doors or a letter to a friend. Storybook language, "Once upon a time," and "happily ever after," become a part of writing samples as the child joins the league of writers with a storytelling purpose. As students progress through the writing stages, various pieces become more automatic and fluent. Handwriting becomes easier, as does the spelling of a majority of words.